Hnefatafl, meaning King’s Table (or literally, Fist Board Game) in Old Norse, is an asymmetric game of pure strategy played by the Vikings and neighboring people with many variations. Its origins are unclear, but it seems that it has appeared during the Viking period, in the 7th or 8th century CE, in Scandinavia and other lands which the Vikings have conquered, as accounted for in archaeological finds of Hnefatafl pieces. 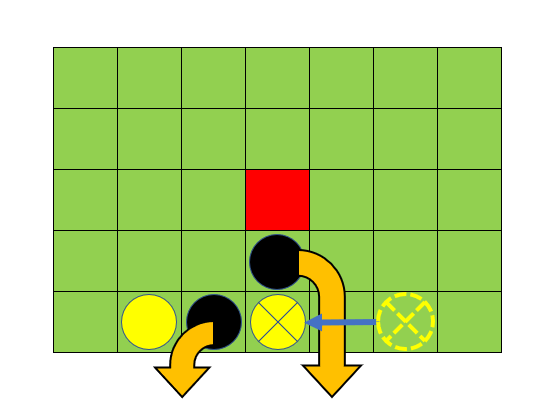 Brandubh is the Irish variation of Hnefatafl. 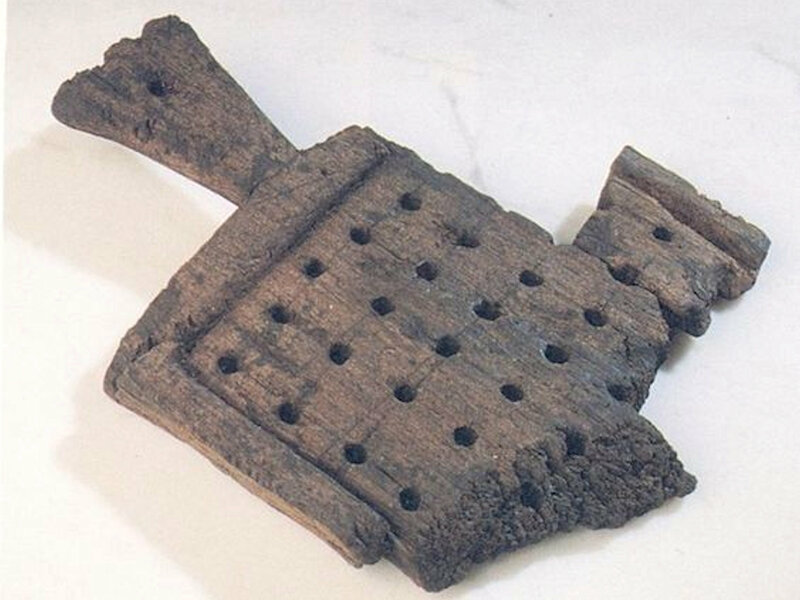 Its board has been found archaeologically in 1932 in Ballinderry crannog near Moate in Westmeath County, Ireland, and is known as the Ballinderry Board. It was dated to the 10th century CE. 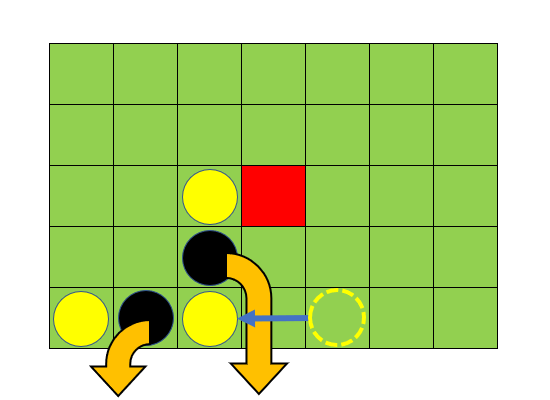 The board has 49 holes in 7×7 grid, with the 4 corner holes marked by semicircles around them, marking the unique feature of Brandubh, the corners where the king has to escape to. Ballinderry Gaming Board. National Museum of Ireland. Dublin, Ireland. In addition, three more Brandubh boards have been found. One is carved on a stone found at the Down Cathedral, in Downpatrick, Northern Ireland, and is currently kept in the Down Country Museum, in Downpatrick. It is double sided, and one side has a 7×7 grid made by crosshatched lines, a circle marking the central throne intersection and 4 semicircles on the corner intersections. Downpatrick Cathedral Gaming Board. Down County Museum, Downpatrick, Northern Ireland. Photo: Mike King, 12/03/2018. 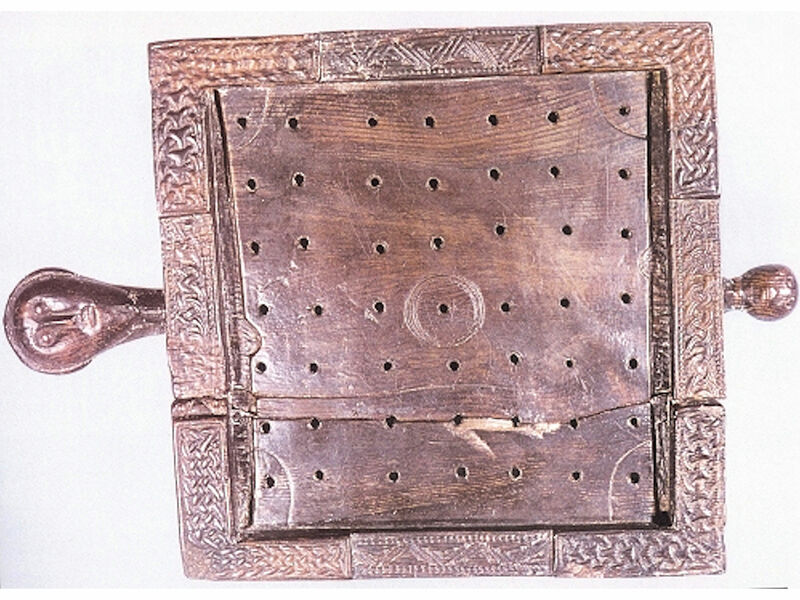 One partial board was found in Waterford, Waterford County, Ireland, and is currently kept in Reginald’s Tower Waterford Treasures Museum on the site. 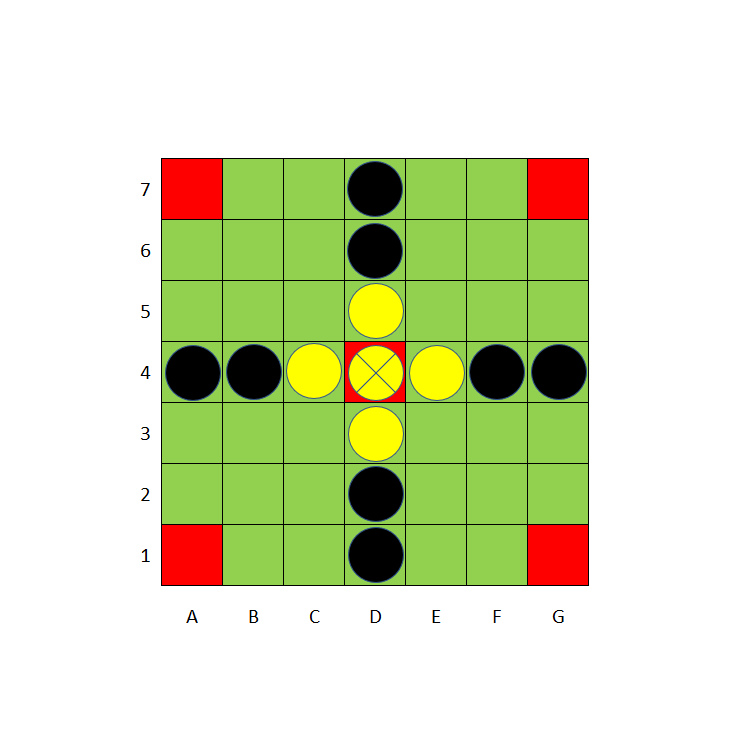 Waterford Hnefatafl Gaming Board. Waterford Treasures Reginalds Tower Museum. Waterford, Ireland. 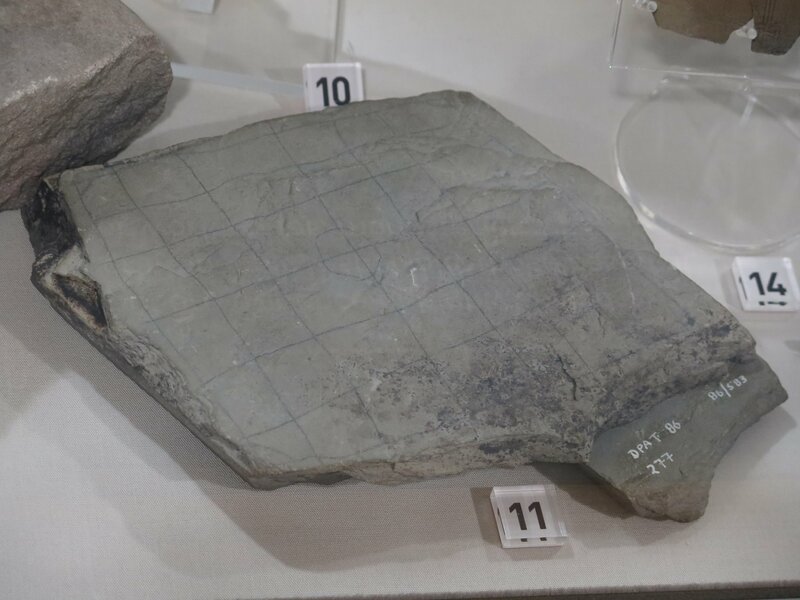 A second partial board was found in Knockanboy, near Derrykeighan, Antrim County, Northern Ireland in 1837 and was documented in an 1838 manuscript with a rough drawing, however, the board itself has been lost. The rules for Brandubh are unknown, but have been reconstructed based on the known rules for Tablut, the special corner markings on the Ballinderry Board and descriptions in Irish poetry. Two Irish poems, Abair riom a Eire ogh from the 14th century, and Acallam na Senórach from the 12th century, describe Brandubh as being played with 13 pieces, the king, 4 defenders, and 8 attackers. 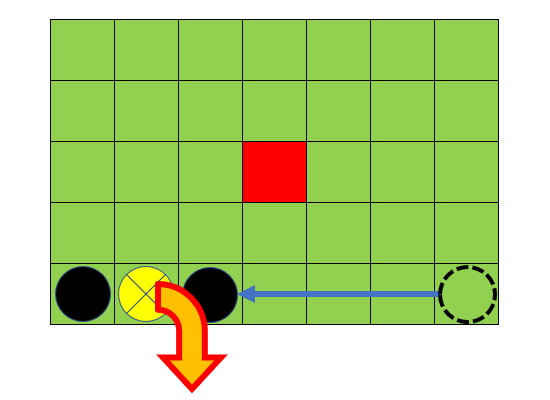 The corner squares being the target safe squares where the king has to arrive to win the game. tú, a righ Bhredh, ar an ttí thall . as fer ar gach tí ad tiomchall. Irish Gaelic text from Knott, Eleanor. “The Bardic Poems of Tadhg Dall O’Huiginn (1550-1591). Volume 2. Translation and Notes.” Irish Texts Society 2 (1922). pp. 198-199.
let them be occupied by thee. thou, O king of Bregia, on yonder square and a man on each side of thee. English translation from Knott, Eleanor. “The Bardic Poems of Tadhg Dall O’Huiginn (1550-1591). Volume 2. Translation and Notes.” Irish Texts Society 2 (1922). pp. 198-199.
cuiciur airgit gil can glór . ocus ochtur do dergór. Irish Gaelic text from Stokes, Whitley, and Ernst Windisch, eds. Irische Texte. Leipzig, 1900. Volume 4, Part 1, p. 112. Lines 3949-3950.
five voicelss men of white silver and eight of red gold. English translation from MacWhite, Eoin. “Early Irish board games.” Eigse: A Journal of Irish Studies 5 (1946): 25-35. The accepted Brandubh rules and the initial setup of the board have been proposed by Eóin MacWhite in 1945, based on the Ballinderry board and mentions of the game in the two mentioned Irish poems. His setup has been tested out in Hnefatafl tournaments conducted by Aage Nielsen and were found to be the most balanced version of Brandubh. For that reason I have chosen to publish his rules and setup in this article. The board is a square with a 7×7 grid. There are 13 pieces total: 8 attackers, 4 defenders, and 1 king. The first player plays for the attackers. The second player plays for the defenders and the king. 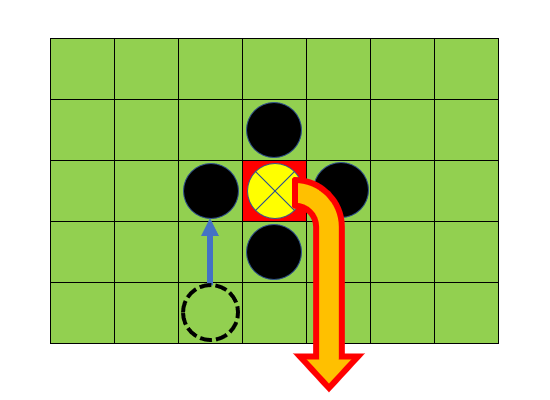 The initial position of the pieces is shown in the following diagram. The king is placed on the throne. The defenders surround him in the shape of a cross. 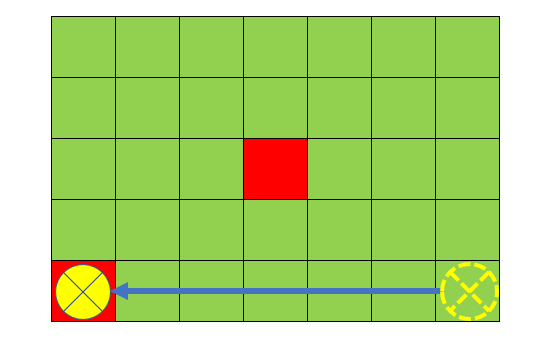 The attackers are placed on four sides in the same lines as the defenders, two per side. The central square, called the throne, and the four marked corner squares may only be occupied by the king. The king can go in and out of the throne at any time. Other pieces may pass through the throne when it is empty, but are not allowed to land on it. 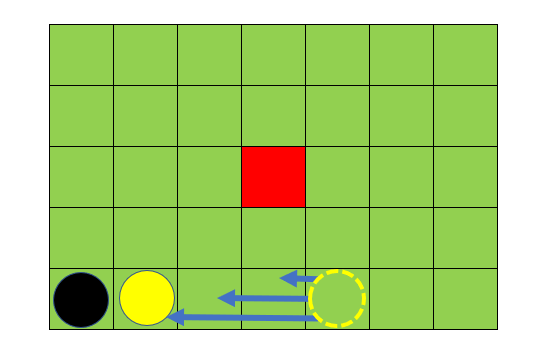 The throne square and the four marked corner squares are hostile to both the attackers and defenders, meaning that when anyone of them is empty it can replace one of the two pieces taking part in a capture. 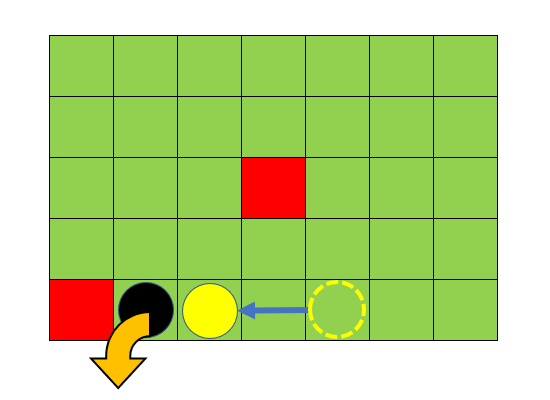 All regular pieces (see about the king below) are captured if they are sandwiched between two enemy pieces, or between an enemy piece and one of the corners, or between an enemy piece and the throne, along a column or a row. 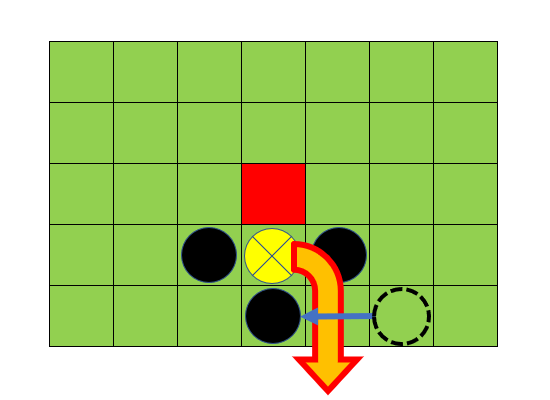 The goal for the defenders (king’s side) is to move the king to any of the 4 marked corner squares. 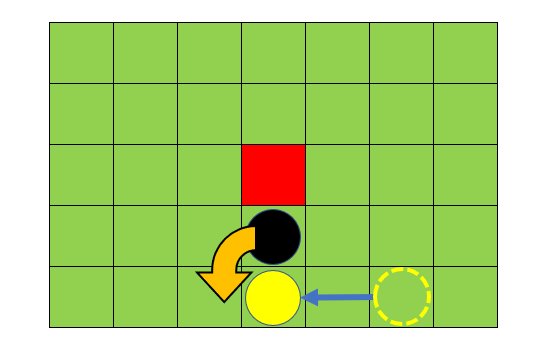 If the king has escaped to any of the corner squares, the defenders win. 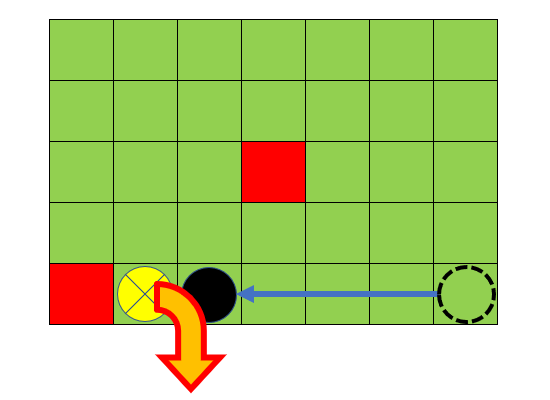 The attackers win if they can capture the king before he escapes to one of the corners. The king is captured like all other pieces by being sandwiched between two opposing pieces or one of the corners and an opposing piece. 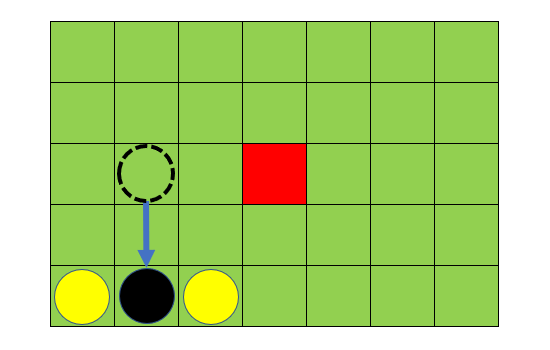 However, if the king is on the throne or on one of the four orthogonal squares next to the throne, then in order to capture him the attackers must surround him on all four sides, and not just two. 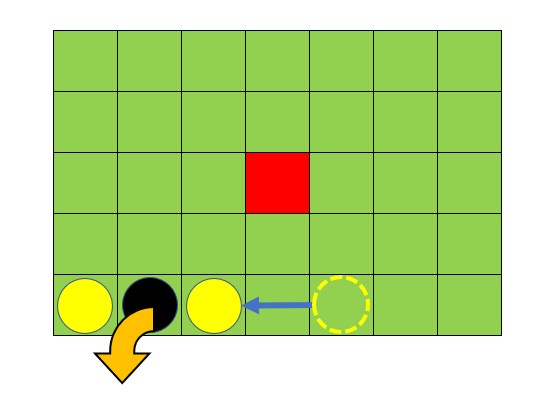 If the king is captured on a cell adjacent to the throne, the throne can count as one of the four capturing sides and may remain empty during capture. 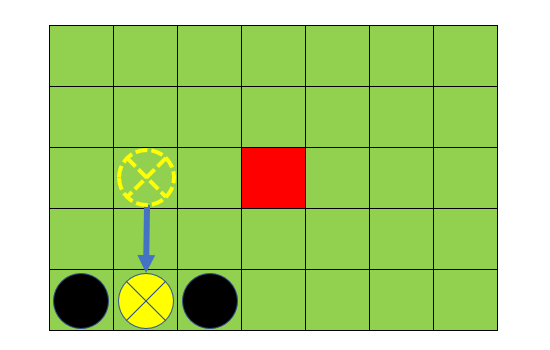 According to the rules presented above, the balance of Brandubh between the attackers and the defenders is similar, but clearly worse than the balance of chess. In chess since white go first they have about 52-59% of winning compared to the black, as has been documented in many different tournament statistical analyses. Aage Nielsen documented based on tournament results, that Brandubh is 1.30 balanced on average, meaning that the defenders win about 23% more often. In other words, the defenders win in Brandubh 73% of the time, compared to 52-59% of the white in chess. MacWhite, Eoin. “Early Irish board games.” Eigse: A Journal of Irish Studies 5 (1946): 25-35. Hey Buddy!, I found this information for you: "Hnefatafl – Brandubh". Here is the website link: https://www.ancientgames.org/hnefatafl-brandubh/. Thank you.